Strong, beautiful and intimidating, the Pitbull Mastiff mix is all dog! This is a breed for the experienced dog owner who is looking for a calm and protective guard dog. The breed is known for its loyalty, size and for its ability to be an excellent guard dog. The English Mastiff Pitbull mix is a giant sized breed that is the result of crossing the English mastiff with a pitbull. The breed is known for its massive size and for its sweet, protective nature. Overall, the English Mastiff Pitbull mix is loyal, friendly and a gentle giant at heart. They thrive with their family and often do very well in homes with older children. They are fiercely protective; however, they tend to not bark a lot, which makes them better as guard than watchdogs. The breed can be quite stubborn and need a firm owner along with consistent rules. However, with proper ownership, the English Mastiff Pitbull mix make a versatile companion animal. They do well for protection, guarding, agility sports and for many other canine related activities and competitions. Like many designer breeds, the English Mastiff Pitbull mix is a breed that does not have a long history. We do know that mixing a number of mastiff breeds to pitbulls began a few decades ago in the creation of a versatile guard dog with the drive of the pitbull and the size of the mastiff. While commonly called the English Mastiff Pitbull mix, they are also known as the American bandogge, pit mastiff or the American Masti-Bull. It should be mentioned that the name is also used to refer to other mastiff breed/pitbull crosses. This giant sized breed should be a show stopped when it comes to size. The breed should be muscular and slightly longer than it is tall with a rectangular shape. Overall, it should have the appearance of a strong, massive dog and should have a level top line with wide shoulders and chest. The head of the dog should be wide with a thick, short muzzle and ears are usually drop ears, unless cropped. The tail is long and thick. While they are tall dogs, they should not have a thin stature like a greyhound or Great Dane but, instead, should have a solid build throughout the body and legs with a thick neck. Pitbull English mastiffs are a large to giant sized breed and should have a long frame that emphasises the size of the breed. The average weight of an English Mastiff Pitbull mix is between 100 to 150 pounds. Males tend to be slightly heavier than females; however, females should have a nice solid build like the males. With height, English Mastiff Pitbull mixs range from 25 to 29 inches tall. The coat of the pitbull mastiff mix is short and thick. As both parent breeds are shorthaired, you should see the same in your pitbull English mastiff puppy. Often, the pitbull English mastiff has a tight undercoat and a short topcoat that is tight to the skin. Some can have a slightly longer coat, but it should still be considered short. The breed is an average shedder. The coat can be a range of colors and have many different types of markings on it. Black masks are not unusual, nor are brindled or pied coats. Colors can be black, white, sable, fawn, red, brown or a combination of those colors. Grooming an English Mastiff Pitbull mix is a very easy task as the coat is very short and, generally, does not collect a lot of dirt. Usually, the dog only needs to be brushed once or twice a week to remove any shed hair. Bathing can be done once a month or as necessary. However, most pitbull English mastiffs can be kept clean with a quick wipe down with a damp cloth. The breed will need nails clipped several times a month and teeth should be brushed several times a week. One important part of grooming is to socialize your pitbull English mastiff to grooming from an early age. This is a big breed and it is important for them to enjoy grooming or you will find it difficult to groom your dog. Also, be prepared for slobber and dirt in your home with this breed. They can slobber a lot and their big paws will track in a lot of mud during those muddier times of the year. When it comes to personality, the pitbull English mastiff is a cut above other dogs. Noble, friendly, and usually very happy, the breed does well with families since both of its parent breeds are excellent family pets. While it has the strength and tenacity of a pitbull terrier, it is also extremely loyal and obedient to its owner and often has the gentle, calm disposition of the English mastiff. The breed is known for its intelligence, which makes it a versatile working dog. They tend to be a bit shy and standoffish with strangers and they can often suffer from separation anxiety since this is a breed that needs to be with their family. The English Mastiff Pitbull mix has an average lifespan of 8 to 12 years. While Pitbull English Mastiffs are a fairly hearty breed, there are several health problems that can affect them so it is important to choose puppies from healthy parents. One of the most important part of pitbull English mastiff ownership is maintaining a proper weight on this breed. Both the Pitbull and the English Mastiff breeds can be prone to obesity and this can lead to long-term health problems that can be very hard on the dog. As with all mix breeds, litter sizes can vary depending on what parent breed the puppy has taken after the most. On average, an English Mastiff Pitbull mix litter will be between 6 to 8 puppies; however, litters as small as 1 or as large as 12 are quite common. Despite their size, the Pitbull English Mastiff mix is a very versatile breed that can live anywhere from small apartments to large homes on acreage. The breed tends to have a medium energy level but they often match their energy to their owners, which means they are likely to relax and sleep when they are at home or walk for miles when they are out with their owners. For this reason, they don’t need a lot of room as long as they have access to daily exercise. The pitbull English mastiff is a breed that is not recommended for new or timid owners due to both their size and their personality. The breed tends to be a stubborn breed and while they can learn quickly, they tend to do things on their own time—including listening to commands—so it is important to be patient while training the breed. The breed needs a strong owner who will give firm and consistent rules and training. The English Mastiff Pitbull mix requires an alpha pack leader when it comes to training. They also require positive reinforcement as the English Mastiff side of their nature have a temperament that can become timid if correction is too harsh. For this reason, owners need to find a training method that is consistent, firm and positive for the best outcome with this breed. Pitbull English Mastiffs do very well with short training sessions of 10 to 15 minutes per session. Try to train at least twice a day and increase time as the pitbull English mastiff puppy grows. It is important to make training fun to keep the dog interested and always stay consistent with your commands. Finally, socialization is a very important part of owning and training a pitbull English mastiff. The main reason for this is because the pitbull parent is a terrier breed. Most terrier breeds have a high prey drive and a tenacious personality that can become aggression with improper training and socialization. Start socialization early, as soon as it is safe for your puppy, and continue it throughout your English Mastiff Pitbull mix’s life. When it comes to energy levels, the English Mastiff Pitbull mix is a breed that doesn’t have an overabundance of energy. They are often known for fitting into their owner’s lifestyle so if you have a more sedentary lifestyle, the pitbull English mastiff will be happy to be sedentary as well. However, with that being said, they do require exercise to help keep them at a good weight since the breed can be prone to obesity. In general, the pitbull English mastiff should have 15 to 30 minutes of exercise every day and does well with one or two walks a day. Remember that these dogs can match your activity level so if you enjoy jogging or are very active, the English Mastiff Pitbull mix will match you and be quite happy being with you on long hikes. They do require mental stimulation as the breed is quite intelligent. Without the stimulation, through training, toys and play sessions, a pitbull English mastiff will become bored and this can lead to destructive behaviors. With exercise, be sure to limit exercise to short, controlled periods when they are younger. Before a year old, they should not be jogging partners and you should discourage a lot of rough play as they can easily injure their hips. After a year old, and when they are mature, the English Mastiff Pitbull mix does very well with long runs, playing with other dogs and just being an overall active breed. Pitbull English mastiffs are a large breed and for that reason, it is important to choose high quality foods that can keep up with their growth. In general, puppy food is not always recommended for the pitbull English mastiff puppy due to the high level of protein in the kibble. This high protein level can lead to a number of joint and bone problems so try to find a kibble that is around 25% protein and no higher than 28%. In addition, calcium to phosphorus should be 1:1 ratio. As adults, your English Mastiff Pitbull mix should eat about 4 and a half to 6 cups of dog food every day. Since the breed is prone to bloat, it is important to break up those portions into 2 or 3 meals. In addition, do not exercise the English Mastiff Pitbull mix for 20 minutes before or after he eats to reduce the risk of bloat. Since this is a large breed, make sure that water is always left out for them and to give more during warmer months. Another rule of thumb with watering is to pick it up before and after a meal so they don’t drink and eat too much at a time. English Mastiff Pitbull mixs enjoy eating so make sure that any treats they have, including dog treats, meat, vegetables and fruit, are added to their daily calories to help prevent obesity. If you are looking for a puppy that loves everyone, look no further than an English Mastiff Pitbull mix puppy. These puppies should be thick, stocky puppies with a lot of weight to them when they head to their new homes. They should be gentle and laid back with good energy, however, they should never be hyper. Because of how quickly they grow, it is important to start training when your Pitbull English Mastiff puppy arrives home. The breed is generally a fast learner; however, they can establish bad habits at a young age, which can be difficult to break in an adult dog. With feeding the English Mastiff Pitbull mix puppy, it is important to keep your puppy lean. The breed can gain weight quickly but the excess weight while they are young can lead to joint and bone problems later in life. Don’t worry about getting your puppy up to an ideal weight number and instead, keep them lean until they are two years old before allowing them to reach their ideal weight. Socialization is a must as soon as it is safe to take your puppy out. While both parent breeds tend to be friendly and loving, the pitbull is a terrier breed, which means they often have more aggression and prey drive. This can translate to the English Mastiff Pitbull mix puppies, which can lead to problems later in life if proper socialization is not given. Puppies should be socialized both inside the house and outside and they should be introduced to people, dogs and other animals to help curb their natural terrier tendencies. This breed is suitable for everyone; however, some consideration should be taken about their size. Generally, they are not well suited to homes with young children, simply because they go through a bull in a china shop stage where they can knock down and accidentally hurt small children. With that being said, it is important to note that the breed is quite patient with children and can thrive in a family with proper training and care. They can be a bit stubborn during training and, because of their size and the need for a strong pack leader, is not ideal for first time owners. 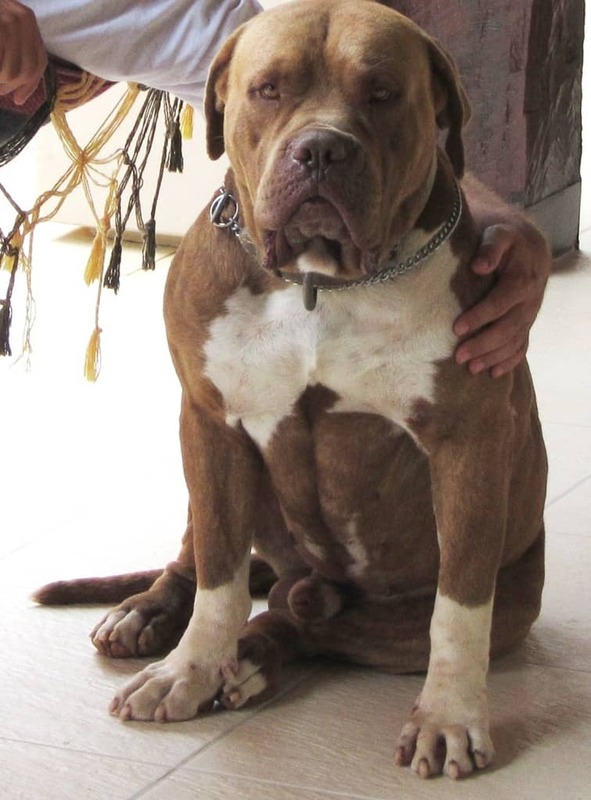 Finally, Pitbull Mastiff mixes can be dog aggressive so they may not do well in a multi-pet home. Regardless, socialization is a must for this breed.